Surprise! It’s a Harry Potter themed lunch! G1 and G3 have their lunches in Thermoses, so that left me with just G2’s lunch to decorate. I finally finished the paint touch-ups (I think) and all of the wall painting at the new house! Of course, that means we’ll have to start packing… Cute lunches may have to take a back seat during the move, but I have a couple more left in me before that pause happens. G2’s lunch is packed in an Easy Lunchbox. In the large section of the bento she has a silicone cup with multigrain gluten-free crackers and a wizard hat and another with Havarti with Dill cheese. I used alphabet food picks to spell LUMOS – the spell in Harry Potter that creates light coming out of the wand. Below, I have a wand with orange light glowing, and a pair of glasses with a lightning scar drawn with food-safe markers. At the top right are two Glutino chocolate wafers and two chocolate macaroons. Finally, at the bottom right are some green grapes. This is my first attempt at making a Harry Potter bento box. On Wednesday, only G2 had to pack a lunch (G1 and G3 had half days). That meant that I could take a little extra time to make a special bento for G2. In addition to her penguin and Pokemon obsession, she also loves Potter. Maybe she just likes things that start with P? Hmmm… and you could say Ponies for her MLP love… this may work. Anyhow, I used our new Easy Lunchboxes to pack up her lunch. She also had some strawberries in a separate container. In this lunch we have a provolone sandwich cut with a puzzle sandwich cutter, and a Firebolt broom drawn with food markers. On either side of the sandwich there are homemade fruit roll-ups and homemade gluten-free goldfish in Gryffindor colored silicone mini-muffin cups. Then, at the right, we have a delicious chocolate cupcake with a fondant “wand” with a white glow around the tip – Lumos! Finally, we have a rice ball with Harry’s hair, glasses, and eyes made out of nori, his scar and mouth made out of radish, and his scarf made from cheddar cheese with food marker stripes. The hardest part of this lunch was making Harry’s glasses. I really need some new tools! Kitchen shears don’t do a great job with nori. Eventually I got it to a point it’s recognizable as Harry. Also, it’s harder than I thought to draw on bread! I’d like to believe I could’ve drawn a better broom on paper, but I may be kidding myself. By the time I got to the wand it was getting late, and I decided a quick one was good enough. That’s a good thing, as the fondant ended up sticking to the lid of the lunchbox, and I would’ve been upset if it had been super detailed. All in all, I’m rather happy with it as a first attempt for Harry Potter, and I have ideas on how to make the next one better! (I need some gluten-free pretzel sticks for the bottom of a broom, for example, but I haven’t gotten over to Whole Foods yet.) G2 was thrilled! She says her friends at her table are starting to look forward to her lunches! 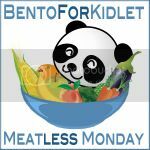 This post is linked to What’s for Lunch Wednesday and Meatless Mondays at Bentos for Kidlet. All of my vegetarian G2’s lunches qualify for Meatless Mondays! 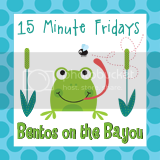 I’ve also linked this post at Fun Food Friday at Eats Amazing and Bento of the Week – Anything Goes.